What do you get when you combine a growing economy and all manner of trade restrictions and tariffs? The most immediate problem is an inventory shortage. That has started to affect a whole slew of manufacturers in a wide variety of sectors. The problem is they can't get the replacement inventory in place fast enough. This is due to a combination of issues that include losing access to the supply that once came from China as well as the labor shortage that has dogged many sectors. Even if the material needed is located, there has been an issue in getting it shipped as there are driver shortages that have compromised a great many trucking companies. This is an issue that will get a lot worse before it gets better. For the 17th consecutive quarter, household debt has climbed in the U.S. It has reached and surpassed crisis levels. It is somewhat disingenuous that U.S. consumers decry the ability of the U.S. government to get debt and deficit under control when they are wholly unable to do so for themselves. As indicated in the chart at the end of this newsletter, the U.S. consumer has resumed their old habits as far as spending and saving is concerned. We are the champion consumers in the world and our mantra remains—"I can't be broke, I still have checks." If there is anything victims of natural disaster can be grateful for, it is that many of them have the insurance they will need to rebuild. There are certainly many exceptions; however, and those people face years of financial ruin. The challenge in the future is this kind of insurance is going to be far harder to get and far more expensive. Fires have now joined with hurricanes to be among the biggest risks for the business and restrictions are likely. These will take the form of limits to where one can get insurance. Living in high-risk areas for fire will likely mean no access or only expensive access to insurance. Why Is U.S. Losing Trade War With China? Part of the issue here is that the whole idea of "winning and losing" a trade war is ludicrous. In fact, there will always be those that win and those that lose. From the standpoint of recent deficit numbers, the U.S. has been losing as there has been major growth in imports and very little export activity. What accounts for this? It is not really any of the tariffs at this point—rather the threat has been enough. Those that anticipated restrictions and tariffs have been moving as much in the way of goods as they can while they can. That has meant expanded imports. At the same time, the dollar has been gaining strength for close to two years. That is detrimental to export activity. It's a very long way from this partial climbdown to an actual peace, but it is a start. The Houthi militia that has been at war with the Saudi-backed Yemeni government has agreed to cut in half missile attacks in preparation for some kind of ceasefire. The western states have been pushing hard for a deal. The Saudi government has been more amenable than in the past as they try to negotiate their way out of the Khashoggi killing scandal. Iran backs the Houthi and has been silent on this new strategy thus far. It is not clear that either France or Germany really wants a deal that leaves the U.K. with much. The latest demands from France indicate a lack of desire to accommodate even the smallest demand. It looks more and more like the EU wants to set an example with the U.K. Break from the EU and you will get nothing. The position on Brexit is as much a warning to nations like Italy as it is a real reaction to the U.K. The meeting of the Asia Pacific Economic Council (APEC) was supposed to be an opportunity for the U.S. and China to work out their differences to some degree and to do this in a forum that was not quite so public as previous meetings had been. It didn't turn out that way—not at all. The utter collapse of this meeting has been blamed on the increased acrimony between the U.S. and China. Many have reported there were moments when the delegates nearly came to blows. There was a single phrase that seemed to trigger the most anger within the Chinese delegation: "We agreed to fight protectionism including all unfair trade practices." This was supposed to be part of the final APEC communiqué, but in the end, the organization chose not to issue one at all. This is the first time that has happened in the 30 years the group has existed. In past years, this would have been looked at as another of those diplomatic sops that sound good but that nobody really acts upon in any meaningful way. This time was different and illustrates just how much tension there is between the U.S. and China. Analysis: It was really the last three words of this phrase that set the Chinese off. This is Trump speak. It's a phrase he has used over and over again to reference China. The reaction of the Chinese was an acknowledgment that they knew it was aimed at them. The bigger story of the APEC meeting was that there was more of a united front building against the Chinese than had been seen before. The U.S. had been successful in getting most of the other members to see things their way—China was a transgressor and violator of trade rules and practices. In truth, most nations skirt close to violating trade rules. The U.S. is no exception. The Chinese have been more blatant as far as these violations are concerned, however. Analysts have been watching the impact of the U.S.-China trade war to see which nation is going to suffer more. The consensus view is that both will feel the impact, but at slightly different times. The U.S. is likely to see the first damage. In many respects, it already has. Ford has become the latest manufacturer that has indicated it will lay workers off (20,000 of them) due to the higher price of steel. These tariffs have cost Ford a billion dollars as steel prices have risen by an average of 40%. The farm sector has been damaged by lack of imports from China. The Chinese have also been affected by their inability to sell to the U.S. and by the fact that many Chinese companies are trying to swallow the tariffs and keep their prices low enough to stay competitive. The bigger picture has China at more risk than the U.S. The simple reason is that China has to find new consumers as active as those in the U.S. Quite frankly, there are none. The U.S. is tasked with finding other sources for the products that were purchased from China. It will take time for other nations to step up and fill that gap, but they are eager to do so. That was one aspect of the APEC meeting that worried the Chinese. The other members of APEC would love to sell more to the U.S. than they do now. If the trade rift between the U.S. and China continues to accelerate, they will doubtless get their opportunity. This is making China more desperate and angrier. Pressure is ramping up. The U.S. will likely feel the consumer impact soon. That could change the equation as well. The U.S. intelligence community has joined with the rest of the investigating agencies to conclude that the Saudi Crown Prince ordered the execution of Jamal Khashoggi. There is a surprising level of unanimity between the European and American intelligence units. They have left no doubt in anyone's mind—except maybe President Trump. He has asserted it may never be known who killed the Saudi dissident despite overwhelming proof provided by Turkish intelligence as well as by other western agencies. Analysis: The major question hovering over all this is how ham-handed it appears to have been. Killing Khashoggi in Turkey was foolish to begin with given how intently the Turks monitor every action taken by their arch-rival, the Saudis. The sense now is this very public assassination was quite deliberate and the Crown Prince Mohammed bin Salman expected and welcomed the outcome. He likely assumed there would be some international outrage at first, but that it would die down as people decided that maintaining relations with this oil state was more important than the life of a journalist. He has certainly been right about Trump and Vladimir Putin as both are accepting his excuses. The real audience for all this is the dissidents in Saudi Arabia as well as those in exile. It is now clear the government of Saudi Arabia will eliminate these voices no matter where they are. Since the assassination, there has been not a peep from that dissident community as they suspect they will be next. They fear nobody will ever be held to account. The majority of the U.S. population is focused on the oncoming feast and an opportunity to lay around in a state of torpor. Not so the nation's hard-working statisticians. They will be releasing reports right up to the last moments before Turkey Day. They can only hope that a few people manage to tear their eyes away from the pumpkin pie and football games. The data this week will show some movement in everything from the housing sector to the output from the nation's factories. Analysis: First up is the data from the Commerce Department on housing starts. Last month, there was a big dip in the starts activity. That matched up well with all the cautionary notes that have been sent all year as regards the sector. It was assumed it was only a matter of time before the "headwinds" became a huge issue. The price of homes has been steadily rising and even the starter home is now pretty pricey. At the same time, the mortgage rates have been rising as well. Not that these are even close to record levels, but they are high enough to serve as a deterrent to some buyers. The biggest issue as far as new buyers are concerned is the down payment. Gone are the days when people offered a tiny fraction of the house price. The combination of higher mortgage rates, higher costs and more cautious banks has been sufficient to drive down payments back to the high levels that dominated prior to that big housing boom. The 5.3% decline in starts from last month will not likely be repeated, but there will not be a recovery. The expectation is for an increase of perhaps 1.6%. There will likely be some additional bad news coming from the National Association of Realtors. There has been a 3.4% decline in the sales of existing homes and a 4.1% decline in sales on an annual basis. This is the seventh straight month of decline. Most expect that run to extend to eight. This is the longest stretch of decline since 2014. The most optimistic assessments hold there will be a slight increase in sales—less than 1%, but many also expect a further decline. The sellers of existing homes are still expecting to get higher prices but, in most markets, there has been a cooling of demand as buyers struggle. This has affected availability as some existing homeowners are not putting their homes on the market at all right now. It is hard to overestimate the importance of the housing sector in the U.S. It is obviously important as far as jobs are concerned as there are legions of people involved in building, selling, insuring, loaning and repairing. It is also the most common store of wealth for the majority of the public. That makes variations in the price of homes very important to the financial health of the whole country. Much of what has been propelling the economy over the course of this recovery has been the housing sector. Watching it slow down is creating a certain amount of concern for the future. The other data to look for this week will come from the University of Michigan's consumer confidence survey. It was slightly down last month. Many are expecting a very similar reading this month—at or around 98.3. We have been critical of the consumer surveys in general as they tend to be very volatile and often move for reasons unrelated to economic news. Consumers react to even the smallest change in the price of gas and they definitely react to events like elections and major natural disasters. There is an expectation that confidence levels eroded to some degree because of the intense vitriol of the election. Lately, there has also been reaction to the fires in California. Consumers are reactive at best. That makes surveys of their attitudes less than ideal as forecast fodder. The good news has been consumers remain confident about their job situation. That kind of attitude will bolster retail activity this time of year. In many of the presentations I make to groups I discuss some of the challenges presented by the five generation world we live in now—from the Greatest Generation to Baby Boomers to Gen-X, to Millennials to the newly arrived Gen-Z. Of all these cohorts, the one that may be facing the biggest shift in terms of expectations is Gen-X. I joke and point out that they are just now starting to realize they will be living with their adult children as well as their parents. Each time I mention this there are laughs from the audience, but there are also a lot of heads nodding with understanding. People come up afterwards and indicate they are living proof. This arrangement is getting more and more common. It is no longer seen as a temporary situation. Analysis: The elderly parent is faced with choices; not all of them are good or practical. They can try to "age in place" but only if they are healthy enough to handle their own affairs. They can move to some form of senior housing, but only if they have the money to do so. The third option is to move in with children. This is very often a 10 to 20-year commitment on the part of the family. At the same time, there are many young adults who simply can't live on their own for financial reasons. The assumption is they will leave the nest at some point to start families of their own, but it is not uncommon for these families to start while they are still under their parent's roof. This means there is a very real potential for a four-generation household. This was the norm (or at least not uncommon) in years past, but since the end of the Second World War, it had been considered rare. This multi-generational arrangement may be making a serious comeback. That will have an impact on everything from the average size of homes to the financial expectations of many. The likelihood is new families will be delayed to one degree or another. They will likely be smaller than they otherwise might have been as well. It is in the rearview mirror at this point. The bitter taste lives on however. The election of people to lead us has become a blood sport with more vitriol and intolerance every year. It has been shocking how far this has gone. Many of those who are now in those leadership positions are wondering if they can accomplish anything at all. The divisions within the country are as extreme as they have been in decades. This extremism leads to nothing but confrontation. What will it take to reverse this pattern? I am not convinced we can at this stage, but if there is any hope, it will have to come from what I think of as the majority of us. Most Americans have not become consumed by hatred and intolerance, but we are letting those who have been so radicalized speak for all of us. We have to speak up and make our voices louder. We know full well that we have to focus on problem solving. To do this we have to be able to cooperate. Cooperating means respecting others when they differ from us. It means trying to find common ground. This requires attention to facts and the ability to resist demagoguery. We can do this and we have done this in the past. We must demand this of ourselves and of others. We have to start calling foul on those who abuse and distort. In just the last few weeks, there has been a never-ending spew of biased nonsense from the left and right. Neither position represents the bulk of the U.S. population. Nearly everybody I talk with is disgusted with the drivel that comes from politicians, some members of the media and self-appointed pundits. That disgust has to move to the next step. That means outright rejection in favor of listening to those who actually want to correct problems and seek solutions. The story all year has been that the U.S. economy is in great shape. 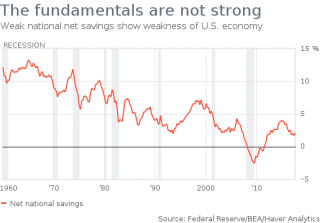 This has been the case because the "fundamentals" have been strong. In some cases, this has been correct—unemployment numbers are very good and the overall growth of GDP has been solid. The fly in the ointment is the rate of national savings. It has been deteriorating for years and has resumed its downward plunge after a recovery post-recession. The population as a whole worried about their exposure and the extent of their leverage, but that fear has worn off and the U.S. is back in a decline. The lack of domestic savings simply means the U.S. is dependent on outside sources of funding—other countries investing in the U.S. in a variety of ways. This has been propelling everything from the stock market to the housing sector and business expansion, but this is fragile support at best. If that investment fades, the U.S. is in real trouble. It is worth noting that a great deal of that investment has been coming from China as well as from Europe, Canada and Mexico—all nations that the U.S. has been less than friendly with of late.